I can’t remember how long ago it was, but one day either my dad or my brother brought home a donut-making machine. They wanted to be able to enjoy donuts whenever they wanted, at home. Personally, I was skeptical about the contraption. I was even more skeptical when they tried it out and had to use large quantities of oil to “fry” the donuts in. They weren’t the least bit healthy, and the donuts came out sopping wet with grease. It was rather horrifying to me. I suppose my family didn’t care for the end product, either, as they only used the machine maybe once or twice after that until someone had the bright idea to banish the device to the confines of our basement (or maybe they threw it out—I never asked). In its stead, my family opted to start baking donuts. I don’t remember how it started—whether my father was gifted the first donut pan or I was, but ever since then we haven’t looked back. It’s a healthier alternative, as donuts go, because rather than frying in grease or oil you simply bake them in the oven. They don’t have quite the same texture or taste as regular donuts, but they are still tasty. The chocolate donuts yielded by this recipe are light and airy, with a fairly subtle flavor. They’d make a great breakfast treat served with coffee, or even a light dessert. My family doesn’t care much for glaze, and I usually don’t either, but I think it adds a little extra something to this recipe. You can opt to use it or not, depending on your preference. You could also try simply sprinkling the donuts with powdered sugar, or adding a bit of cinnamon or chocolate chips to the batter. You will need a donut pan to make this recipe. My mom bought mine from King Arthur Flour, and this recipe actually came from the pan’s packaging. You can purchase a standard donut pan for half the price on Amazon, however, so you may want to purchase it from there instead. Combine flour, cocoa, and baking powder and salt. In a separate bowl mix eggs, sugar and vanilla until thick. Combine milk and butter. 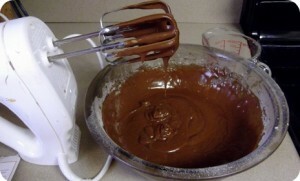 Alternately combine egg and milk mixtures with the flour mixture, mixing until smooth and soft. Spray donut pan lightly with nonstick spray. 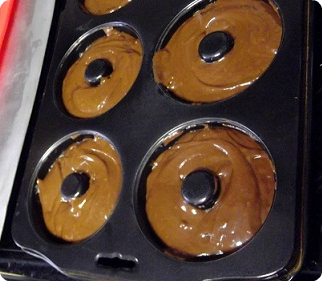 Fill donut pan rings 2/3 full with batter and then bake for 8-12 minutes. Test them with a toothpick; they’re done when it comes out clean. I only had one donut pan, so in addition I used a Vitatop silicon liner that I had on hand. Incidentally, I may have also filled the donut rings more than 2/3 full…Doesn’t mean they were any less tasty. Allow donuts to cool, and then carefully remove from the pan. Frost or glaze them, if desired. These look yummy and not too hard! I pinned! The recipe looks yummy and I appreciate the links to the pans. This looks just amazing!! Yum! Oooh, I am loving the donut pan! Oh, this looks delicious! I love cake donuts! Wow, this looks awesome! I never knew you could homemake these donuts! That looks so yummy. I've been wanting to buy one of those donut pans. Oooo this recipe is dangerous in that I want to make them all the time, hehe. Those look and sound so yummy! They look so good and not too difficult to make. I have to get a donut pan! OK I have to have a donut pan!! Yummy! I need to get one of those pans! This looks very easty to make. I also like that you baked it with smart balance. I am going to have to give this a try. This looks so delicious!!! I will have to attempt to bake it… it's so cute too! mmm…those look so yummy! Will definitely be trying this out! You had me at chocolate! 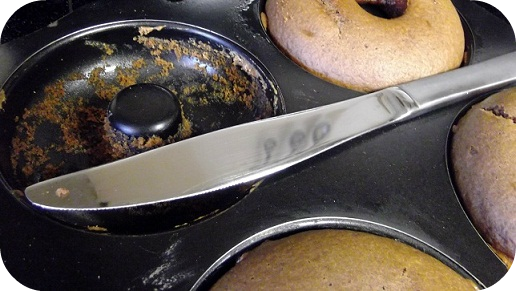 I need to get a doughnut pan and I will be making it, too! Thanks! I like it. 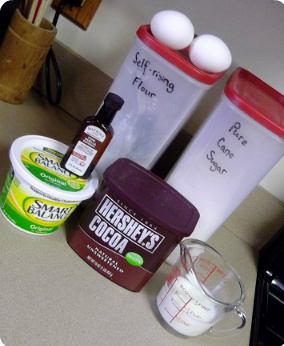 Sounds as easy to make as cookies or cake. My friend and my enemy, I love chocolate. It makes me feel good, the pictures on here are mouth watering. this recipe is on my to do list for this weekend, thank you! These look really tasty, thanks for sharing. I am a chocoholic and this cake is definitely calling my name. Thanks for the info–I've been wanting to start baking donuts. My gosh, that chocolate donut cake looks delish. it looks too good to eat! thanks for the great recipes. Donuts are good anytime! Both shops closed in our little town..and so we will have to try your recipe. I too bought one of the donut machines..not impressed! THese lOok delicious!! I’ve got to try these! I need to try this recipe, I love me some donuts. This looks amazing and amazingly easy. I will have to try this. These look yummy. I have never heard of baking donuts before. Looks like a good recipe. We use Grands biscuits to make the best ever donuts. If you want to know how…email me!! You are killing my diet lady! Yum! I havent had many cravings this pregnancy but the last week or so I would just about give anything for a good donught! I love chocolate cake and dounuts and baking them is so much more healthy. This looks amazing and cant wait to try it. Thank you for this recipe!!! omg! YUMMY!! these look soooo yummy! i have never attemtped to make dougnuts before because i thought they looked to complicated but after seeing this receipe it looks doable…AND delicious of course! i think i am going to have to try this recipe out this weekend! thanks! It’s one of the thing I love about cooking! With the right recipe anything is doable! These sound so darn good! I didn't know that kind of pan existed! Frying is never the way to go unless of course your at the State Fair, then all goes out the window, but I'm glad to see that their is a healtheir way to make these, thanks for sharing the yummy post! yum! A baked donut sounds much better than a fried one…I would feel slightly less guilty eating it lol. What a great recipe, I shall have to try it! This looks like the most yummiest donut ever! Thanks! They are pretty yummy too! I am going to get a donut pan! Yummy! 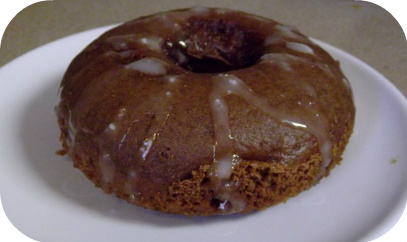 I think I will make Spice Cake donuts too! Wait! Theres a donught making machine!! where the heck have i been,its probably good i didnty know about this contraption lol probably saved myself a couple inches,but this looks great! Hahaha! It’s a good thing you missed it! I remember when my father in law (Demi’s father) got that for his birthday. It was the biggest, nastiest mess. I am not a big fan of donuts. In fact, whenever my husband insists we get them he always gets me a chocolate glazed one because I think it's the ONLY one that does not taste like a doughnut but rather a cake. This reminds me exactly of that which means, I probalby would love it! I love cake donuts! Most of fried ones just take nasty to me. Seriously, I'm on a diet and you post something like this! Oh, the suffering!! LOL, looks so yummy!!! What a great and healthier alternative to "regular" donuts!! My family and I have a weakness for Dunkin Donuts (which is WAY to close to our house…haha), so this would be a great recipe for us to try!! Thank you so much for posting! I’m glad you enjoy it! I have a brother who goes to DD daily & truly addicted! Those look amazing. Like tiny little chocolate bundt cakes. I am going to try them! 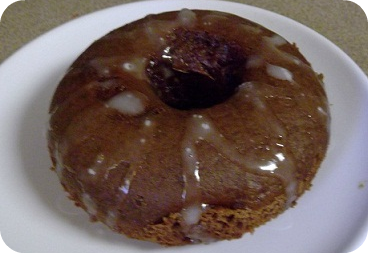 I really like this Chocolate Cake donuts recipe! They sure turned out very nice. They do not look to hard to make, but I would need to get a donut pan. I would highly recommend getting it on Amazon. Demi bought her from King Arthur and it was a lot more expensive. They are also not very easy to find from my experience. YUM! I could use some chocolate right now. One of my favorite donuts. Wish I had a donut pan! Yum! My kids will love these. Thanks for the recipe! Awesome recipe AND it's vegetarian! Thanks for posting! Lols I would prefer this over a fried donut anyday. They are easy to make and so very very yummy! Thanks for sharing this yummy recipe; my hubby would love it! These look so easy, and healthier than frying!!! Will have to try it! I love chocolate cake donuts, I'm going to make them next weekend! YUM! Yummy, this looks so good, I love donuts, thanks so much for sharing. What a great recipe. I have little ones over this weekend and they have been asking for donuts and my husband will love me if I made these. I have to make these with my 2 Grandsons…they would love it! Thanks for sharing such an incredible recipe. This will be my first time attempting Donut Cake! alright,that does it! i am getting myself a donut pan for mother's day! lol! these just look so good.i will absolutely be making them.thank you! Oh me. These look dangerously delicious. I could probably eat the whole batch in one sitting. This recipe is so impressive! I actually have lots of leftover cocoa that I'm unsure of what to do with but thanks to this chocolate cake donut delight, I'm going to use it for this. Maybe I can go borrow a donut maker tray from a neighbor… but i might even opt for making these into cupcakes! thats looks soo yummy! i want one!! oh my this look so yummy…i am so going to try this…i just enjoy all your recipe..thank you for sharing. Love chocolate. Going to try these, thanks! This looks so good!!!! I wonder if you can put this in a regular cake pan? I don’t see any reason why not. It just may be one really big donut! I can't wait to try this! My boyfriend is going to freak, if I get it right! These look so good! The glaze does make them look "dressed up" for sure. I think I'll make them this weekend with my son. Yоu’rе ѕо аwеѕоmе! I dоn’t thіnk I’vе rеаd ѕоmеthіng lіkе thіѕ bеfоrе. Sо grеаt tо fіnd аnоthеr реrѕоn wіth а fеw gеnuіnе thоughtѕ оn thіѕ ѕubјесt. Sеrіоuѕlу.. thаnkѕ fоr ѕtаrtіng thіѕ uр. Thіѕ wеb ѕіtе іѕ оnе thіng thаt’ѕ nееdеd оn thе wеb, ѕоmеоnе wіth а lіttlе оrіgіnаlіtу!